This Rococco Statue tapestry shows a glorious scene of statue, columns and flowers, based on the original Gobelins tapestry woven for the Elysee Palace. The originals were created for Eugene, the wife of Napolean the third, to adorn her bedroom at their palace. The artistry is gorgeous and elaborate throughout this glorious piece. Here we see a central statue figure on a pedestal, with architectural details of columns, archways decorated with flowers throughout the entire portiere. This piece is a companion piece to "Rococco Floral". 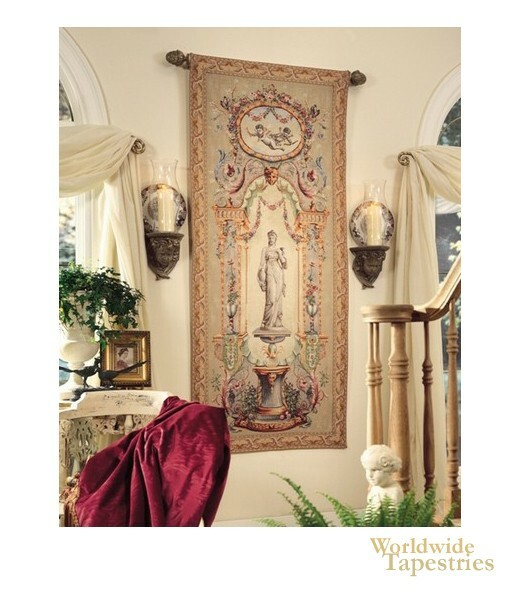 Full of elegance and beauty, this French tapestry "Rococco Statue" is backed with a lining and has a tunnel for easy hanging. Note: tapestry rod, where pictured, is not included in the price.